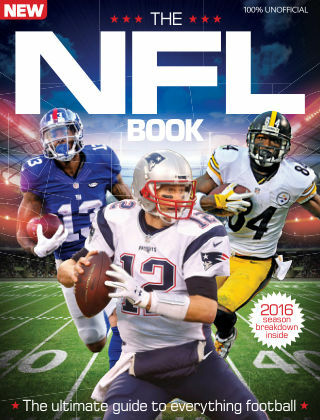 With Readly you can read The NFL Book and thousands of other magazines on your tablet and smartphone. Get access to all with just one subscription. New releases and back issues – all included. When it comes to thrilling sporting spectacles, there's nothing else quite like the NFL. A deep sport filled with complex strategies, played some of the most physically gifted athletes in the world, football has grown into one of the most compelling forms of sporting entertainment on Earth. With the drama of Super Bowl 50 behind us, the 2016 season promises to be the best the league has seen yet. The NFL Book is a complete guide to the United States' favourite sport – a celebration of football for newcomers and gridiron veterans alike. Tapping into to the league’s growing global popularity, the book covers everything from the basic rules of football, to the sport’s most incredible records and statistics. It also profiles every NFL franchise, from the Buffalo Bills to the Seattle Seahawks, as well counting down the greatest players and games in the history of the league. No matter who you follow, there’s something for every football fan here. Featuring: NFL: All You Need to Know - From the draft to the playoffs and everything in between, get to grips with the most exciting sports league in the world. 50 Iconic NFL Players - Discover some of the most influential players to ever grace the National Football League and exactly what it was that made them so special. 10 Greatest NFL Games of All Time - Home to some of the biggest sporting contests in history, the NFL is proof positive of how impactful sport can be at its best. Meet the Teams - From Buffalo and New England to Seattle and San Francisco, get the lowdown on the 2016 season with our detailed profiles on every NFL team.